We offer the best composting worms for the gardener.? 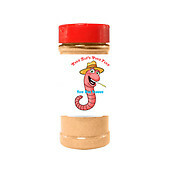 Our worms are top quality and inexpensive taking the hassles out of composting.? Gardening should be fun and interesting, and we want to help make it that way.? All orders are shipped via USPS Priority Mail.? Composting is the decomposition of organic matter.? This can be done with or without worms.? Worms expedite the composting process.? When the organic food passes through the Earthworm it becomes rich in nutrients.? The end process is called worm castings.? This term is really just a fancy way of saying worm poop.? What do I need to compost with worms? You will need worms, a bin or bed and food.? You can start with only a few composting worms.? We sell red worms, Euroworms and African Night Crawlers as compost worm. ?A bucket for your food scraps will also help.? You can leave those scraps to accumulate weekly and then add to your bin.? We recommend the KC Kitchen Composter for that.? The KC is a container with a lid, but also have a carbon filter to keep the smell and flies out.? You should also have some shredded news paper, Cardboard or peat moss.? Soak well and then drain the water so the bedding is moist but not wet. ?Place four inches of this material in the bin and then bury your food scraps.? This will keep the flies away.? Add your worms and let them to the rest. Periodically check the moister level of your worm bed and compost.? Also check the pH.? If your pH in you compost heap is too high the composting process by the worms will be hampered and the worms will crawl off or die.? Also check the composting material for too much water.? Worm can tolerate varied conditions but too much water and lack of air will cause the compost to turn anaerobic.? This will kill the worms. If you have a normal worm bin like we sell, we recommend 1000 worms to start.? If you want to start with a smaller bin then go with 500.?If you want to know exactly how many worms you will need, then use our worm calculator to figure it out. Just choose the type of worm, and then put in the length and width of your worm composting bed or bin in inches. You can compost manure, as long as it has gone past the heating stage.? It is a good idea to allow your bedding and manure or food to sit a few days after mixing.? This will cause any heat created by the initial break down to not harm the worms.? Set up your bin prior to receiving your worms so that this process has ample time.? After that, you can add food as needed.? You can compost manure, newspaper in moderation leaves if using Euroworms, food scraps (except for meat).? Your compost will look like granules of dirt or dust when it is done.? You will start with fluffy peat moss and newspaper shreds, food and manure and you will end up with a solid type consistency.? These granules are worm castings.? When you see more of these that food it is time to remove the worms to a new container. This is done by dumping the bin out in the day light or under a light.? Scoop away the top layers and the worms will dig down to get away from the light.? Keep doing this.? You will soon have a mass of worms in one pile and castings in another.? The worms can be placed in a new bin.? You can take the castings and use them or you can put the compost and castings through one more process.? There are eggs and small worms still in the compost and worm castings.? If you water the composted material and add a little manure or food to the top the capsules/eggs will hatch.? Those worms will go directly to the food where they can be removed.? Once this is done,? and it can take another month to complete this, you will have clean casting or compost for your plants.? If you let the casting site for a few weeks they will further break down and you will have?a great dressing product for plants and vegetables.? Do not leave castings uncovered outside or a few heavy rain could wash out the nutrients and the composted material away. If you are looking to compost with our without worms we have located several composters and composting tools that will really help get your composting food scraps, leaves and manure right away.